Ask The Bellwether: What do you teach in Advanced Drop Spindling? What do you teach in Advanced Drop Spindling? Advanced Drop Spindling earns you a Drop Spindle Ph. D.! If you've mastered your top or bottom whorl spindle and want to take it to the next level, this is the class for you! In this fun class we'll cover a variety of top whorl tricks, bottom whorl tricks, and handy techniques to get more out of your spindling: Andean plying, Peruvian wind-on, Kick-spinning, plying fine singles, Navajo plying, Bottom whorl speed-plying, and more! Materials provided ($8): basic top and bottom whorl spindles to spin with during class, wool roving. 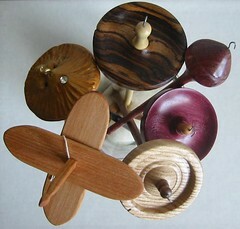 Student bring: basic spindle-spinning skills (top or bottom whorl). Spindles are available for purchase. If it's a Ph. D., there has to be at least one lecture! Bottom whorl (non-Turkish) cop: X –wind on or cone. Frog Hair and Hamster Floss on Fiber Life. Silk requires a lot of twist to hang together. “Silk” spindles are spindles that spin very quickly, so the silk is twisted into yarn before it can put the “drop” in your drop spindle ;-) Silk also has a very long staple, so you can spin thread even on a 1 ounce silk spindle. Silk spindle physics: center weight (heavy shaft, UFO– or bulb-shape whorl) == fast spin. Halla Nahkas are 1.5-2 ounces (great for worsted weight or plying). Top whorl techniques apply here too. If you want to thigh roll, build cop above whorl as is done for bottom-whorl spindles (X-wind-on or cone). Ahka techniques can be applied to Norge spindles as well. This is basically a top-whorl spindle. Traditionally, the bottom whorl was removable, and was put on to ply—it adds weight; you would then get a repeatable size cop of yarn, built-up between the whorls. The two whorls give a more stable spin, as well. There’s a great photo in the flickr group SpindleShots called Overloaded Spindle where she’s wound yarn below the lower whorl as well! For a complete list of classes from the Belle, see the class list. For detailed descriptions of other classes see the class topic. Not all classes have a detailed description; if you would like one for a class on the list, feel free to contact me with your request. Thanks! Oh, that sounds great! I wish I could go and take this course! Hi Amelia, where do you find the time! Sounds great! I wish I could come, but going to another country for a spindle class might be considered extreme. I would do it if the spare cash was lying around. I am sure you will all have a great time!